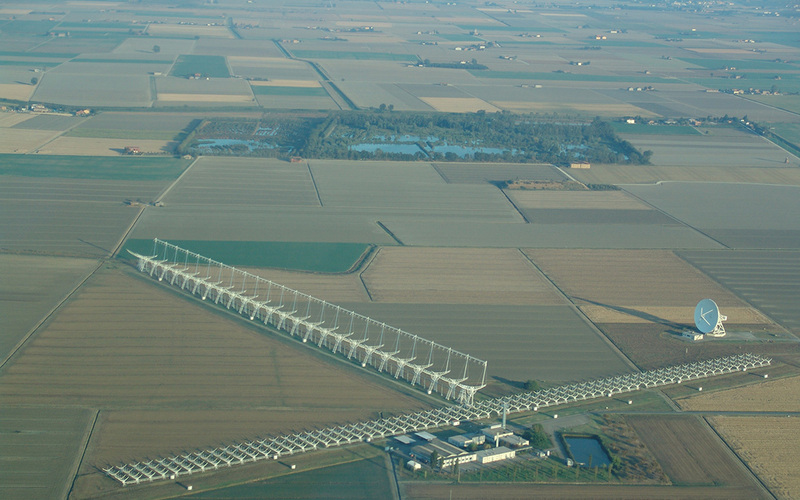 The 32-m dish of the Medicina radio observatory (operated by the Italian National Institute for Astrophysics), built in 1983, operates in the range 1.4 – 26.5 GHz. It is employed for both interferometric and single-dish observations. In the former case it works with other antennas, located in different European or worldwide countries taking part to the “EVN (European Very Long Baseline Interferometry Network) Consortium. The main goal of the consortium is to obtain high resolution data in order to analyse fine details of the radio sources. Another application of interferometric observations is in the Geodesy field. The VLBI techniques are able to measure the distances among the involved antennas with an accuracy of a few millimetres. This allows the study of the crustal plates movements with unparalleled precision. The Northern Cross was conceived in order to receive radio waves with a central frequency of 408 MHz (73.5 cm in wavelength) with a 2.5-MHz bandwidth. Available observing mode: single dish, local interferometry, Very Long Baseline Interferometry (VLBI). VLBI: astronomy and geodesy, pulsar research and pulsar searches, at 22 GHz observations of H2O masers, molecular spectroscopy, receiver development. Single-dish: spectrometry of water and methanol maser sources, sky surveys, flux variability of compact extragalactic sources, polarimetric observations of Galactic regions, planetary studies.